Let AJR help bring out the best qualities in your witnesses during their depositions and testimony. One of the biggest favors you can do for your clients and witnesses is to ensure they are properly prepared for testimony. Often subtle mannerisms can severely undermine their credibility. For example, research has shown that signs of anxiety are often misinterpreted by jurors as deceit. A few hours of feedback and videotaping can usually improve the presentations of clients and witnesses significantly, giving them higher scores in the crucial seven "C's,"; Composure, Congruence, Character, Commitment, Credibility, Concern, and Communication. your needs and wishes. 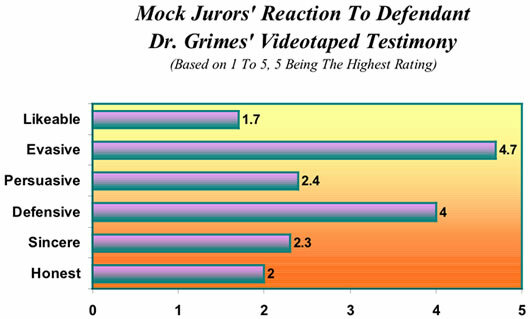 At times, it is beneficial to show videotaped testimony of lay witnesses and expert witnesses to mock trials or focus groups to obtain feedback on issues such as credibility, believability, helpfulness, clarity, and competence. The preceding is a graph from such a project (the doctor's name has been changed to ensure confidentiality). It is wise to consider preparing witnesses for depositions as well as trial testimony. One to three weeks prior to the deposition or testifying is usually the best time frame for this. We find that although witnesses may initially be defensive or reluctant to participate, AJR's approach to preparation quickly brings witnesses to the same "playing field" as the legal team. The result is enthusiastic, cooperative and helpful witnesses who testify with confidence and credibility. Witnesses invariably feel less anxious about testifying after our sessions, and express appreciation for this preparation. 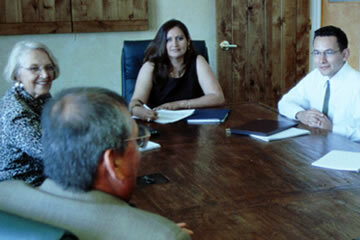 These sessions usually improve relations and foster bonds between witnesses and the legal team as well. Witness preparation sessions usually consist of an initial strategy meeting with the witness, with an emphasis on learning from that witness, and sharing case concerns and strategy with that witness when appropriate. These sessions result in valuable information and insights. Following this is a more structured process, where the witness is asked questions in both a direct and cross-examination. This session is videotaped with counsel's approval. The consultant and legal team work together to provide feedback for the witness on areas that will appeal to a jury, and those needing improvement. While practice is important for the witness to feel confident, efforts are taken to avoid the appearance of an overly polished or rehearsed delivery. Some witnesses require only one session, while other witnesses will benefit from several sessions, which usually last a half day each. AJR also discusses with witnesses the "dos and don'ts" of testifying. These points are provided in written form to the attorneys as well, to pass along to their witnesses if they so wish. In order to maintain the attorney-client privilege, AJR consultants work with witnesses only while members of the legal team are present.